The financial crisis has already become a cliché but what happened on Black Monday, August 24, cannot be taken too lightly. Although the financial markets have somewhat recovered across the globe, hundreds of billions of dollars wiped off from the world’s financial markets as the Chinese rout sent shares tumbling in Europe, Asia and the US. The US stock market has suffered its biggest sell-off in four years. The Dow Jones ended the day down 588 points, having shed more than 1,000 points in early trading. The S&P 500 and NASDAQ are both in correction territory, down 10 percent on their recent peaks. In London, almost £ 74 billion was wiped off the value of the FTSE 100 Index, in a rout led by mining giants. European stock markets suffered their worst days trading since 2011, almost 900 billion euros wiped off from the financial markets in the month of August. The sell-off began in Asia 19 hours ago, where Australia’s market suffered its biggest fall since 2009 and Japan’s Nikkei slumped over 4 percent. 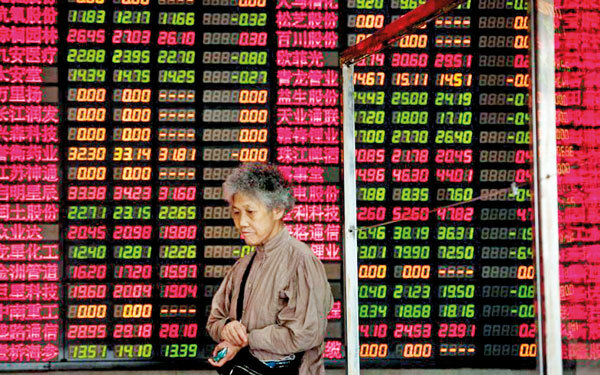 But China was the worst hit, with the Shanghai Composite Index dropping 8.5 percent in the biggest sell-off since 2007. It is also reported by Bloomberg, about US $ 5.3 trillion wiped off from the global financial markets in the month of August, recording the biggest decline on a monthly basis. No one in the financial world would have expected it was coming this fast but there were early warnings being given at the beginning of this year by most influential investors/businessmen in the US today; Warren Buffet, John Paulson and George Soros told that the stock market crash is on the way. Their argument was exactly to the point that the period of low interest rates coupled with quantitative easing (QE) by major economies would in turn fuel economic booms, encouraging excessive risk taking. Booms would then turn to busts, which policymakers would respond with even lower rates. The low interest rate environment did three things to the world economy: it essentially took the ‘income’ out of once-reliable, stable, fixed-income investments like treasuries, bonds and certificates of deposit (CDs); it made it easy to borrow money and it also meant that the stock market was the only avenue for investors looking to make money. In fact, stocks have a price-to-earnings ratio of 25.67. Over the last 10 years, that average has been 15. Stocks are currently priced 71 percent higher than their 10-year average. So, it didn’t take long for George Soros to lose faith in the US markets, as he began to pull the plug. In the same way, over the last couple of years, Warren Buffett’s holding company, Berkshire Hathaway, has been dumping its exposure to American stocks that rely on consumer spending. Despite the stock market rout, the prospect of US interest rates being raised next month or even towards the end of this year is still on the cards. If it does go ahead as planned at the next Federal Reserve (FED) committee meeting in September, it would have some serious implications to emerging and developing economies. This would not be a one-off increase in interest rates, it would simply be a beginning of a higher rates environment for the years to come and it would eventually push Europe to follow the same pattern. With an expected lift off in the US interest rates, borrowing will become more expensive over the coming months, perhaps for years. On the other hand, the current lower prices for oil and other strategic commodities have intensified the slowdown in developing countries, many of which depend heavily on commodity exports. While the net importers like Sri Lanka is obviously benefitting from lower inflation, fiscal spending pressures and import cost, low oil prices have so far been slow to spur more economic activity but in the long run it will. In a globalised world, in which many economies are increasingly linked as a result of the removal of barriers to trade, investment and finance, problems in one country will inevitably affect others. The impact of the global crisis depends on the degree to which the countries are integrated into the global economy. Any global financial crisis will have an effect on the Sri Lankan economy, policy, governance and social wellbeing. So it is important to assess how exactly the shockwaves from the crisis have travelled and what this means for Sri Lanka. Purely on trading perspective: the main transmission channels from the global economic slowdown to the Sri Lankan economy are to be receding demand for our exports, reversing terms of trade and slackened capital inflows but lower prices for oil and other strategic commodities are obviously benefiting. To take this into more perspective, let’s look at how dependent and interconnected we are in the global trade. Chart 1 on Balance of Trade (BOT) indicates the level of participation in the international trade. BOT is the difference between a country’s imports and its exports. BOT is the largest component of a country’s Balance of Payments (BOP). Over the last decade or more, the country has a trade deficit, which means we import more than we export. How do we tackle the trade deficit? 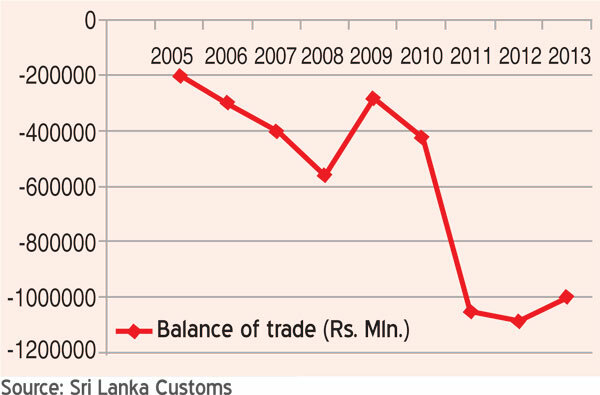 For a developing country like Sri Lanka, which has become increasingly integrated into global trade and finance over the past few decades, the crisis is not one of credit but of falling demand. The extent of the effects of the global crisis on Sri Lanka depends on the importance of exports and capital inflows in the economy. Countries that depend on exports of primary commodities other than oil have also been hit hard because of the sharp decline in prices of export commodities. So this is a big advantage to our country. The increasing integration of world finance also means that the crisis has a serious effect, both directly and indirectly, on investment in Sri Lanka. Not only foreign direct investment (FDI) is declining but also foreign financial institutions are withdrawing their investments in the country’s stock exchange, resulting in sharp declines, often of more than 50 percent, in stock prices and large devaluations, often of more than 25 percent. The drop in stock prices further hurts investment; the effect of currency devaluation, however, depends on the share of imported inputs in production or in the consumption basket of workers. Policy responses to the current financial crisis will depend on the country’s fiscal and BOP position. Countries such as China, with abundant foreign exchange reserves and small fiscal deficits, will be able to undertake effective expansionary fiscal policy. India, with ample reserves but large fiscal deficits, has relied more on monetary policy, particularly in making more and easier credit available to producers. Russia and other oil exporters, which depend largely on oil revenues that are now declining, are experiencing a worsening of their governments’ fiscal position, which limits their ability to undertake expansionary fiscal policy. Sri Lanka for an example, lacks large reserves or the BOP situation is precarious, might not be able to adopt expansionary fiscal policy unless they are assured of financing on easy terms, if they end up with BOP deficits, the confidence of the government to engage in expansionary policies could be increased by expanding the resources of the World Bank and International Monetary Fund (IMF) and loosening the conditions under which these institutions lend. Clearly, some significant structural changes will need to be made but there are more deep-seated causes for the current problems stemming from the nature of international money and adjustment. Since demand is likely to remain low for some time and the fiscal needs of the government are likely to absorb a substantial part of the savings, Sri Lanka will have to take some serious action on its own to foster economic growth, including accelerating trade could be enhanced by tariff cuts and the encouragement of preferential trade agreements among neighbouring countries. Crude is the biggest import item in Sri Lanka, which costs about Rs.180,000-190,000 million per year in value to our economy (source: Central Bank of Sri Lanka). 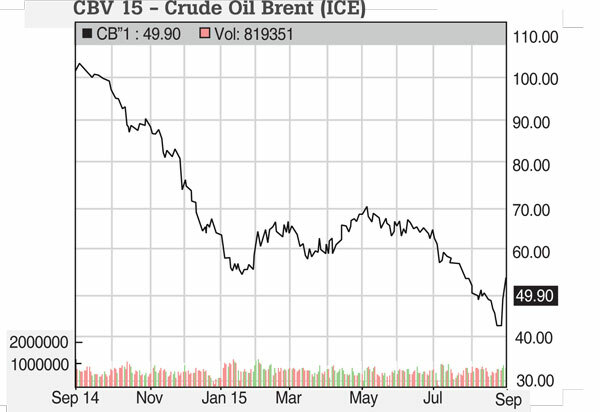 Price changes in crude have a direct impact on the country’s BOT. This time last year, crude was trading over US $ 100 per barrel before the prices collapsed below the US $ 50 per barrel mark. 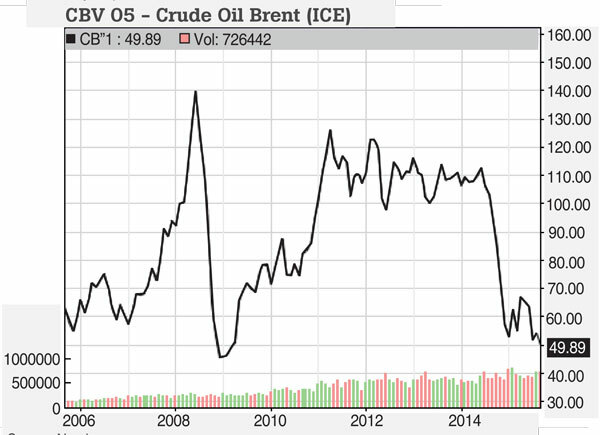 One would question as to why crude prices are so low? Well, this is a complicated question, but it boils down to the simple economics of supply and demand. The US domestic production has nearly doubled over the last six years, pushing out oil imports that need to find another home. Saudi, Nigerian and Algerian oil that once was sold in the US is suddenly competing for Asian markets and the producers are forced to drop prices. Canadian and Iraqi oil production and exports are rising year after year. Even the Russians, with all their economic problems, managed to keep pumping oil than ever before. On the demand side, the economies of Europe and developing countries are weakening and vehicles are becoming more energy efficient. So, the demand for fuel is lagging. China’s recent devaluation of its currency suggests the economy of the world’s biggest oil importer may be worse off than expected. Chart 2 shows the short-term price movements since September last year, whereas Chart 3 indicates the 10-year price history. The recent slump in crude prices is the biggest pull back in the crude oil history. The market sentiment suggests that bears are still riding the market, prices will trade below the US $ 40 mark, on the other hand, some analysts believe crude will bounce back simply because the current prices are not sustainable. If it does go below this level, it will have a devastating impact on producers; subsequently the oil producers will soon cut their production and the marginal producers will go out of business. It is only a matter of time before the mighty oil cartel cuts the output and drives up oil prices. Falling crude prices will ease its current account deficit. At the same time, the cost of Sri Lanka’s fuel subsidies could fall - but only if the oil prices stay low. How do we take advantage of the current low crude as an importing nation? We cannot regret not taking forward hedging decisions when market prices at this low, we should be locking in as much as this downturn as possible, but we can also regret non-hedging if the market prices rise. One way to fix a maximum price for buying while taking advantage of the falling prices is to purchase call options that guarantee a ceiling price but do not oblige the buyer to use them if it is cheaper to buy somewhere else. Of course, such flexibility comes with a premium to pay to get hold of the option contract. Therefore, it is natural to keep part of future purchase volume exposed to spot prices, another part locked-in at a forward price agreed today and the rest of the volume hedged at a price that is applied only if the prevailing market price at delivery is higher. In a nutshell, we are faced with the strategic decisions of allocating today the purchase of future volumes between the spot, futures and the option markets. Such decision-making under uncertainty can be modelled mathematically, in a simulation-based framework, given the current market prices, historical market volatility/correlations and the trader’s risk appetite. This yields long-term optimal decisions compared to ad-hoc methods.